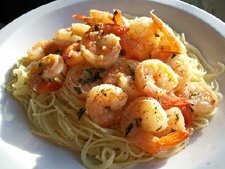 Fast and easy Shrimp Scampi is ready in just minutes, an ideal dish for two on a special evening. While pasta is cooking, Melt 2 tablespoons butter in 2 tablespoons olive oil over medium-high heat in a large skillet. Saute the garlic for a minute or so. Add wine and lemon juice and bring to a boil. Add 2 tablespoons butter and 2 tablespoons oil. 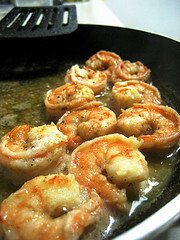 When the butter has melted, return the shrimp to the pan along with the parsley and cooked pasta. Stir well, season with salt and pepper. Serve immediately. Tip: When cooking shrimp watch closely. The shrimp should just turn pink and then removed from the heat. It will be rubbery if over cooked.